The Real Absinthe Blog: All 108 cocktails with absinthe from the Savoy Cocktail book ... plus a few more! All 108 cocktails with absinthe from the Savoy Cocktail book ... plus a few more! UPDATE (February 2013): I have compiled a Pinterest board with photos of every one of the Savoy Hotel absinthe cocktails. Absinthe cocktails? 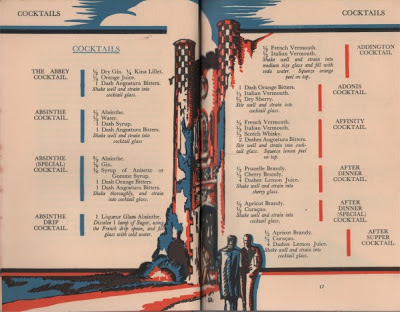 Here is one of the longest lists of cocktails containing absinthe that I have ever seen, and it comes from The Savoy Cocktail Book* (first published 1930). It is recommended that you do not try all of these in one session, or even in one month! Most of the photos here come from Erik Ellestad's superb Savoy Stomp blog. Essential reading! Thanks, Erik. Here are the first two pages of the Savoy list: rather scarily, the first page contains three cocktails with absinthe. It was probably this page that got me started on the idea of compiling this list. Luckily, perhaps, most other pages do not have so many absinthe drinks! 2. Absinthe (Special) cocktail: with gin, orange bitters and Angostura bitters. 4. Apparent Cocktail (see above): with gin and Dubonnet. 5. Atty Cocktail: with gin, French vermouth, and creme de violette. 7. Blackthorn Cocktail: with Irish whiskey, Angostura bitters and French vermouth (shown above). 8. Block and Fall Cocktail: with calvados, brandy and Cointreau. 9. Bombay Cocktail (2): with Cointreau, brandy, French vermouth and Italian vermouth. 10. Brazil Cocktail: with Angotura bitters, French vermouth and sherry. 12. Bunny Hug Cocktail: with gin and whisky. 13. Cabaret Cocktail: with Angostura bitters, gin and Dubonnet or Lillet blanc. 16. Chrysanthemum Cocktail: with dry vermouth and Benedictine. 17. Cordova Cocktail: with gin, sweet vermouth and cream. 18. Corpse Reviver (2): with gin, Cointreau, Lillet blanc and lemon juice. Here is my version! 19. Deep Sea Cocktail: with gin, dry vermouth and orange bitters. 20. Dempsey Cocktail: with gin, apple brandy and grenadine. 21. Depth Charge Cocktail: with Lillet and gin. 22. Dixie Cocktail: with orange juice, gin and dry vermouth. 23. Dream Cocktail: with brandy and Cointreau. 24. Du Barry Cocktail: with gin, dry vermouth and bitters. 25. 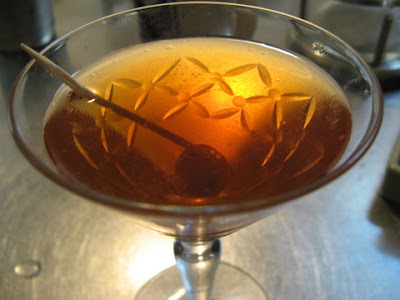 Duchess Cocktail: with dry vermouth and sweet vermouth. 27. Earthquake Cocktail: with whisky and gin. 28. E. Nos Cocktail: with gin and dry vermouth. 30. Fascinator Cocktail: with gin, dry vermouth and mint leaves. 31. Fourth Degree Cocktail: with gin, French vermouth, and Italian vermouth. 32. Gasper Cocktail: with gin and sugar. 33. Glad Eye Cocktail: with peppermint white liqueur. 34. Harry’s Cocktail: with gin and sweet vermouth. 35. Hasty Cocktail: with gin, dry vermouth, and grenadine. 36. Irish (or Irish Whiskey) Cocktail: with Irish whiskey, curacao, maraschino, and bitters (see above). 37. Jeyplak Cocktail: with gin and sweet vermouth. 38. 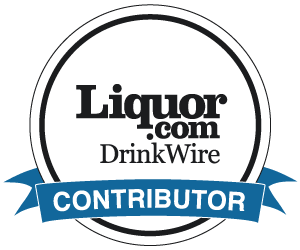 Johnnie Mack Cocktail: with sloe gin liqueur and dry Orange curacao liqueur. 39. Knock out Cocktail: with gin, dry vermouth, and creme de menthe. 40. Kup’s Indispensable Cocktail: with gin, sweet vermouth, and dry vermouth. 41. Ladies’ Cocktail: with whisky, anisette, and bitters. 42. Lawhill Cocktail: with whiskey, dry vermouth, maraschino, and bitters. 43. Linstead Cocktail: with whisky, pineapple juice, sugar, and lemon juice. 44. London Cocktail: with orange bitters, gomme sirop, and gin. 45. Macaroni Cocktail: with Italian vermouth. 46. 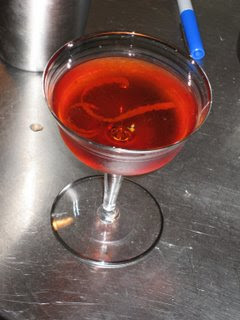 McClelland Cocktail: with sloe gin liqueur and triple sec. 47. Maiden’s Blush Cocktail (2): with gin and grenadine. 4 glasses of gin, 1.5 glasses Italian vermouth, A third of a glass of Orange-flower water. Before shaking, add a dash of Absinthe and one or two dashes of Angostura Bitters. 49. Maurice Cocktail: with gin, sweet vermouth, dry vermouth, and orange juice. 50. Melba Cocktail: with grenadine, light rum, lemon juice, and Swedish punch. 51. Merry Widow Cocktail: bitters, vermouth, Benedictine, and gin. 52. Millionaire Cocktail (2): with curaçao, grenadine, whisky, and egg white. 53. Minnehaha Cocktail: with gin, sweet vermouth, dry vermouth, and orange juice. 54. Modern Cocktail (No. 1): with dark rum, orange bitters, whisky, and lemon juice. 55. Modern Cocktail (No. 2): with sloe gin liqueur, grenadine, orange bitters, and whisky. 56. Monkey Gland Cocktail: with gin, orange juice, and grenadine. Nice article from the San Francisco Chronicle. 57. Moon-raker Cocktail: with brandy and peach brandy. 58. Morning Cocktail: with Angostura bitters, brandy, and Italian vermouth. 59. Morning Glory Cocktail: with gum syrup, curacoa, Boker's bitters, brandy, and whisky. 60. Nick’s Own Cocktail: with Angostura bitters, Italian vermouth, and brandy. 61. Nine-Pick Cocktail, with 2/3 Absinthe, 1/3 Gin, 1 Dash Angostura Bitters, 1 Dash Orange Bitters, 1 Dash Syrup. 62. Nineteen Cocktail, with 1 Dash Absinthe, 1/6 Dry Gin, 1/6 Kirsch, 2/3 French Vermouth, 4 Dashes Syrup. 65. Olivette Cocktail Use absinthe, not anisette. 79. Sazerac: with cognac (or rye whiskey) and Peychaud's bitters. 87. T.N.T. Cocktail Several other absinthe cocktails on this page. 104. Absinthe Frappé Half way down the page. 105. The Gangadine Cocktail. This one nearly got away, since the Savoy lists the ingredients as 1 Teaspoonful Framboise Syrup, 1/3 Oxygenée Cusenier, 1/3 White Mint and 1/3 Gin. Pre=prohibition, Oxygenée Cusenier was indeed an absinthe, but post-prohibition it was re-formulated in the direction of a pastis. It is possible that Harry Craddock could have meant either of these. 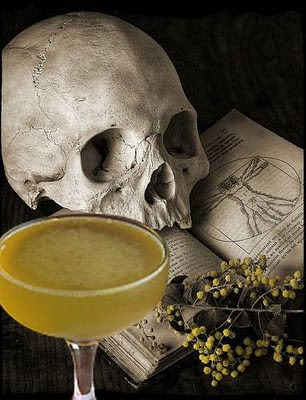 Erik Ellestad uses absinthe in his re-creation, so I will go along with him. The three that got away, including one that was first published in the 1934 Edition, and two that I missed. After 105 cocktails, I should be allowed to have missed just one or two! I especially like the Absinthe Frappé and, of course, the Sazerac. 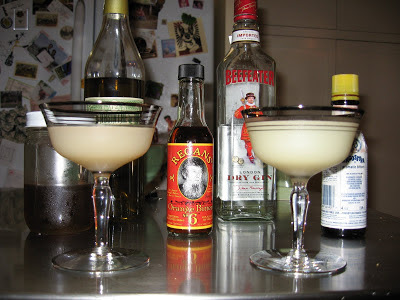 I also love the Absinthe Sour, not specifically listed here, which I first tasted in Shanghai in May 2005. What are your favourites? It is interesting that these cocktails were being served in London around 1930, given that absinthe sales in France were banned from 1915. Exports of remaining French absinthe stocks continued after 1915, and legal production of absinthe shifted from France to Spain. So Londoners could have been enjoying pre-ban French absinthe or French-style absinthe produced in Spain, or illegal absinthe from France or Switzerland. Indeed the Lancet of 1930 refers to absinthe being imported into the UK between 1921 and 1929 from Spain, France and Holland (the last may have originated elsewhere, e.g. Switzerland. In any case, those bottles would be highly prized by collectors now. But in the "carpe diem" days of 1930, it seems, judging by this cocktail list, that absinthe drinkers had other things on their minds! * A footnote on the book's author: Harry Craddock was born in the UK, then emigrated to the USA, becoming a US citizen. He left the USA during Prohibition and joined the American Bar at the Savoy Hotel, London, in 1923. Craddock was one of the most famous cocktail barmen of the 1920s and 1930s. Craddock’s “The Savoy Cocktail Book” was published in 1930, and is still in print today. Craddock invented a number of classic cocktails possibly including the White Lady, and popularised the Dry Martini. (Source: Wikipedia). I have aded here two very recent UK creations to complement the 104 1930's recipes. I like both the idea and the taste of the first: a very modern cocktail (the Caipirinha) using a timeless ingredient (absinthe). I have yet to try the second. 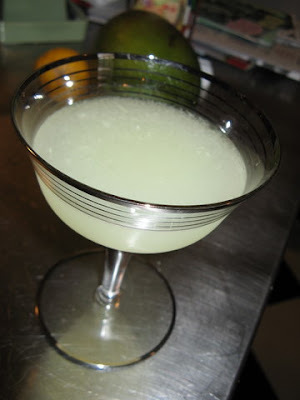 WARNING: If you don't like burning absinthe, don't read the second recipe! Using your small rocks/old fashioned add the bar spoon of sugar, 50ml Clandestine and 12.5ml ice water. Using the spoon, stir the contents allowing for all the sugar to seperate. Squeeze and drop the 5 pieces of lime in to the drink and once again use the bar spoon to stir the contents. Finally fill the glass with crushed ice and stir all ingredients through the drink, making sure that all flavours are perfectly mixed together. In a brandy balloon, add 2 of the absinthe soaked orange zests with some of the brown sugar and 25ml Clandestine. Usinge a lighter, light the Absinthe and start swirling the glass allowing the sugar to caramelise and some of the alcohol to burn off. After about a minute blow out the flame and using a hawthorn strainer, transfer into a chilled flute. 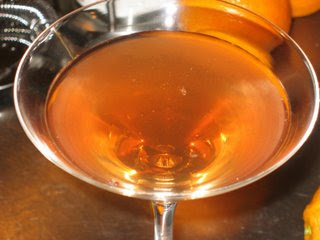 Top up with Champagne and garnish with a flamed absinthe soaked orange zest (beware as this can be slightly dangerous!). Both recipes created by Darroch of Black Tie Bartending. Ah yes but since Henri Jacque lived between the wars I think UN peu Loufoque and Chief Patissier are safe from him either having a credit card or having any internet access n'est pas? Now if he was lucky enough to be alive today he could no doubt get excellant service from you! Thanks for stopping by my blog! I've added you to my RSS reader, and intend to delve into your archives. It's great to see an absinthe blog that's as knowledgeable as this one.